This will not be a full AAR, more like a test game. 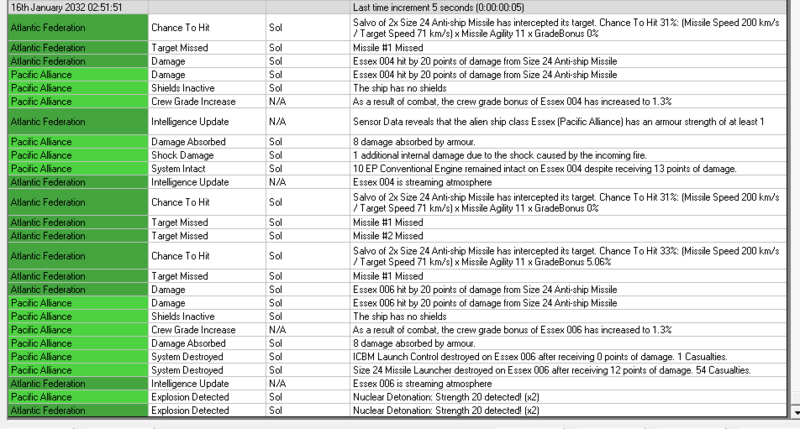 Inspired by the TL-0 ship designs that xenoscepter posted in the Bureau of Ship Design, I decided to see what a conventional tech war in Sol would look like while we all wait for C# Aurora. The Atlantic Federation and the Pacific Alliance are super-states, having absorbed every country in the world. The two hyper-powers are now locked in a Cold War of epic proportions, with hundreds of divisions and thousands of nuclear missiles ready to fly. Luckily for humanity, the discovery of Trans-Newtonian minerals and theory has provided an outlet for the two powers and, in a moment of sanity, their leadership agreed that any conflict on Earth would mean the total extinction of the human race. But in space, all bets are off - sort of. Harkening back to the complicated gentleman rules of duelling from the 18th and 19th centuries, the Federation (FED) and the Alliance (ALL) have agreed to refrain, in all circumstances, from attacking each other on Earth or in Earth orbit, creating a tiny safe haven in the solar system. Everywhere else, it's the rule of the jungle and survival of the fittest. Thus, instead of peaceful and commercial exploitation of space, military forces in space became the highest priority. Both sides are repurposing ICBMs (size 24 missile) and TBMs (size 10 missiles) for use by combat vessels in space, vessels using conventional engines and armour, guided by repurposed ICBM fire-controls and the most basic TN active sensors (sensitivity 10). Since then, it has been 5 years of research and build-up. Due to extensive espionage and satellite surveillance, the Alliance and the Federation have largely mirrored each other's progress. First combat ships are about to be launched from their first shipyard. The ships are almost identical since there isn't much available to them and size is a real concern what with shipyard sizes. Thanks to better scientists and a better administrator, the Pacific Alliance pulls ahead in ship production. By the end of 2030, the PAN has 3 Essex class armoured cruisers and 1 Lexington class missile frigate, while the Atlantic Federation Navy has only a single Tribal class missile cruiser. Due to an oversight in planning, the PAN is unable to provide sufficient maintenance for their ships. Production priorities are quickly changed to compensate and as more facilities come online, all ships will undergo an overhaul. Several failures of the missile launchers and engines are suffered but fixed thanks to maintenance supplies. This information is soon picked up by AFN intelligence and their leadership plans to take advantage of the maintenance issues in a desperate bid to overcome the numerical superiority of PAN. The AFN only waits for the third Tribal CG to be built. At the same time, Alliance scientists discover Duranium armour and PAN designers make improvements to both Essex and Lexington, increasing their armour thanks to the lighter weight of Duranium compared to conventional materials. These revised versions are not yet under construction as both Alliance shipyards are busy building the originals. On 11 January 2032, AFN receives its third Tribal CG. Immediately a Moon Force TG is formed and ordered to head to Luna, forcing the PAN to either yield it to the Federation or to rise to the challenge, despite the maintenance clocks of their ships running high. PAN does not immediately react. One of the Lexington's is being refitted to the B model, so the PAN leadership decides to wait few days for another Essex CA to be constructed, planning to overwhelm the AFN with numbers. 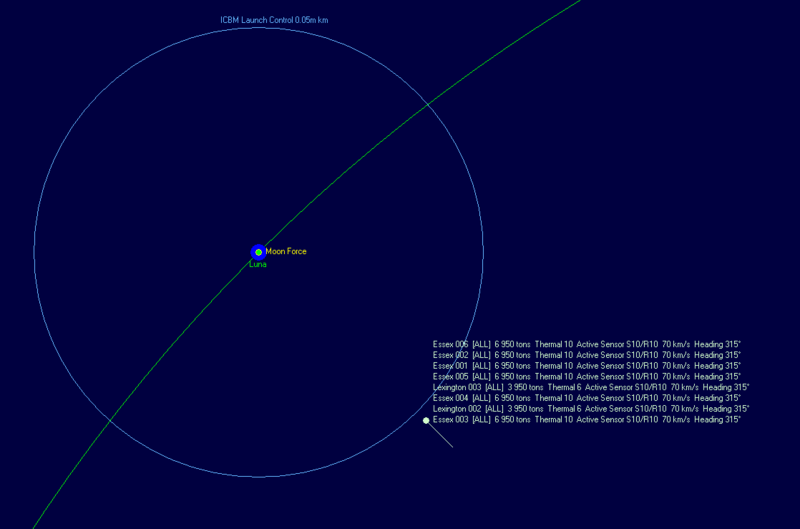 On 16 January 2032, PAN orders its Combat Group - consisting of 6 Essex CA and 2 Lexington DDG - to sally forth and wipe out the AFN presence on Luna. Active sensors flare to life! Minutes tick by as nervous people grip their consoles on both sides. Only few seconds later the myopic fire-controls repurposed from old ICBM silos of both sides acquire their targets. All ships are ordered to fire at will. Each Tribal targets one Essex, whereas two Essex's target each Tribal, and the Lexingtons pick Tribal 001 and Tribal 002 as their targets. The launchers work as hoped and 22 missiles leap into action. This one Alpha Strike is also the only one, as there is currently no known technology to reload missile launchers in space. Magazines are still on the drawing board. At 200 km/s, the missiles are much faster than the ships, yet space is big and it will take some time for them to reach their targets. The PAN Combat Group keeps moving ahead to ensure that the enemy Tribals remain targeted by the extremely limited fire-controls. The AFN Moon Force commander realizes that their force can head deeper into space and thus ensure that his missiles hit first. This will reduce the closing speed of enemy missiles from 200 km/s to 128 km/s. Of course, the Moon Force has no method of actually spotting the incoming missiles but they are certain that PAN ships would have launched at the same time as AFN did. At 02:50 the PAN Combat Group commander realizes that AFN vessels are moving away from Luna. Orders are immediately given to chasing the Tribals. 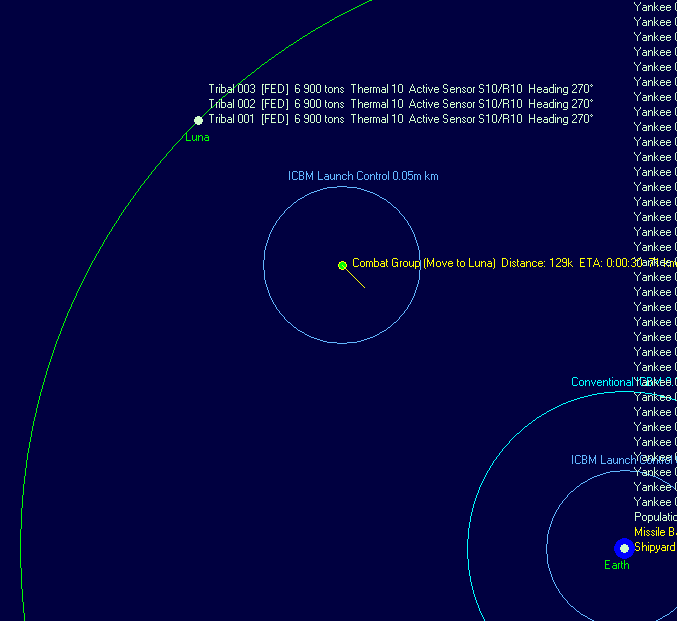 Despite the navigators complying instantly, it is now certain that AFN missiles, if they were launched at the same time as PAN did, would hit first. Crews are ordered to brace themselves. It must be the automatically built-in minimal passive sensors in the PAN ships that detect the incoming missiles - these ICBMs have huge conventional engines. 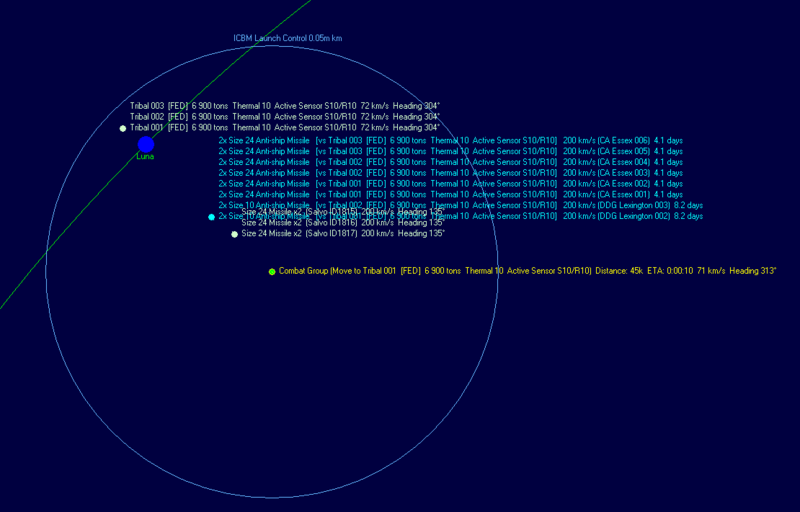 The results are disappointing for AFN - only two enemy ships are streaming atmosphere. Meanwhile, the PAN is jubilant - they lost only two missiles due to a destroyed fire-control on Essex 006. That ship is ordered to turn back to Earth for repairs while the rest of the Combat Group will chase the AFN ships to exact revenge. It only takes 3 more minutes despite the AFN running their engines as hot as possible. Out of 16 missiles, 7 miss and 9 hit. Tribal 001 is destroyed and Tribal 002 is badly damaged, its sensor going offline and the ship streams atmosphere from three different locations. PAN commander is not entirely satisfied. AFN commander is happy he made it to the lifeboat alive with 57 other survivors. Both sides must return to Earth for repairs and reloads. Analysts on both sides pour over recordings of the battle and interview the commanders and crew. The incredible survivability of the large engines of the cruisers saved the damaged ships from complete destruction. The ability of the ships to narrowly dodge missiles at the last moment is equally remarkable - it is clear that missiles need to be even faster and more agile to hit the enemy reliably.